Products, People, Places and Things Representing the Best in Coastal Living. Welcome to our blog "Coastal Creations & Design." 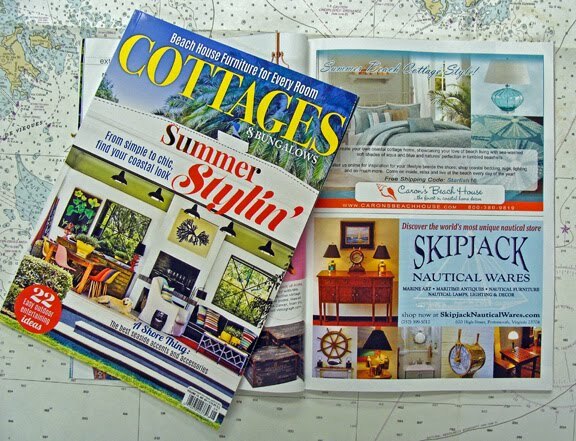 We hope that you'll visit us often and read about our favorite coastal destinations, beach-inspired products, inviting seaside spaces, original artists works and people living the coastal lifestyle. I was recently introduced to Laurel & Wolf, a professional online interior design business that offers interior design services entirely online and challenged to consider writing a blog titled "How Would You Remodel Your Living Room?" So I thought to myself, well, that's an interesting idea and decided to take on the request. As the co-owner with my wife Alison of Skipjack Nautical Wares & Marine Art Gallery, we are accustomed to working directly with customers & interior designers who are in the process of decorating their coastal/ beach home, and supplying them with the appropriate marine art, nautical furniture, furnishings lamps & lighting, and decorative accessories suitable for a well designed nautical interior and exterior too! We are one of a handful of dealers that are exposed to truly exceptional authentic maritime items- the nautical world is our oyster! Another motivator for this blog is to correct the fable believed by our customers that our personal home must be like visiting a museum. Far from the truth. Though we do own some fine examples of nautical rarities, our home is pretty much designed for everyday comfortable living as well as for casual entertaining with family and friends. The bulk of our nautical treasures are available to you at our store. historic Olde Towne Portsmouth, Virginia. 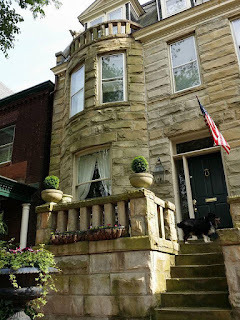 We live in a brownstone townhouse built in 1916 and located in Olde Towne Portsmouth, Virginia, one of America's earliest and most historic seaports, a fitting place for us to live and run our nautical antiques, marine art and furnishings business. The parlor (living room) is not large but does features a beautiful bowed front window, old pine floors, a canted fireplace and wide doorways with raised paneled pocket doors that open to both the front foyer and stairs and the formal dining room. The room also features 10 foot high ceilings with decorative running vine crown moldings and an original plaster center medallion that surrounds the crystal chandelier. Since the question at hand is how would you remodel your living room, I'll leave it at that. I visited Laurel & Wolf's website and perused through their site. Their online service allows you an opportunity to design your space from the comfort of your home, your office, or even on-the-go using your internet-accessible device! Pretty neat concept. So, I started by reviewing their design questionnaire and following their advise to give them a sense of your desires for designing your dream space. One challenge that most of us have is the ability to relate our desires to a designer for them to work with to create that perfect space for you. Part of the questionnaire asks for you to provide images of the type of things that you like. My experience has found that to be the biggest challenge. Most people have a better sense of what they do not like more than what they do, so I always recommend to a customer to visit such sites as as Pinterest https://www.pinterest.com/ and use their search engine to assist you in finding visual ideas to help you develop you perfect space. Here's the link to my boards on Pinterest This scrapbook of ideas will give your designer pictures of the right parts and pieces to work into your design for an environment that will be what you are seeking. Remember, a picture is worth a thousand words! Linda Merrill of Linda Merrill Decorative Surroundings, Boston Mass. I then visited their directory of interior designers and searched through the numerous pages of designers with examples of their work. With a fairly clear picture of what I would want as a living room, I visited the numerous designers pages and reviewed examples of their finished work and found a designer that design style really sums up my taste and would love to have design a living space for our abode. 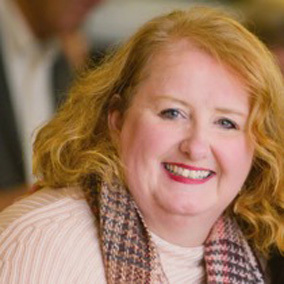 Linda Merrill, owner and principal designer of Linda Merrill Decorative Surroundings located in Boston, Massachusetts was my pick. 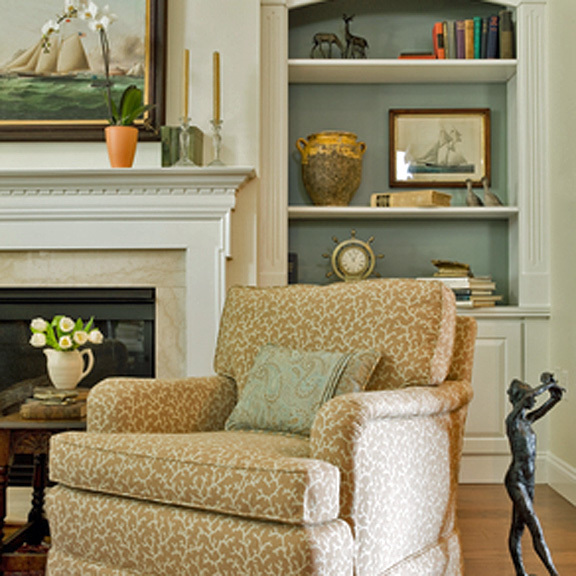 maritime art and furnishings together with a pleasing fabrics and color palette. Well that made total sense since the largest number of Skipjack's customers are from coastal Massachusetts, so I guess my tastes tend to fall along the traditional seafarers homes of the 19th century, the days of tall ships and whaling. Linda's design work blended the wonderful period items that I love to live with together with a liveable space with traditional upholstered (comfortable) seating furniture and an eye-pleasing color palette that brought it all together. interesting and comfortable living space. Linda would be my choice, but I could quickly conclude that all of the designers on this site had so much to offer and it would be pretty easy for anyone to find one that fits their budget and taste. The rest is up to you, so design away! Seriously Seaworthy Nautical Belts & Buckles for Men - Get Hooked in 2015! 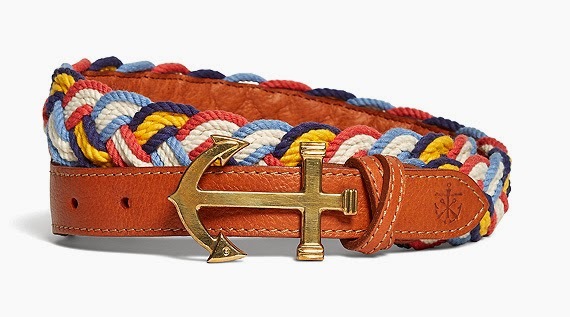 Are you searching for the best nautical belts to complete your spring wardrobe? Well, this year's choices once again features some old favorites with a few new contender's to add to the fold. Some are priced for the weekend boater, others obviously for the proprietor of a luxurious yacht! But either way, here' a selection of our "Top Picks" for the spring of 2015 of our favorite seriously sea-worthy nautical inspired belts that will certainly satisfy even the saltiest of tastes and perfect for your coastal lifestyle! Skipjack's brass fish hook belt buckle leads the way both in design AND price, and is a favorite for both the nautical inspired and fisherman alike. You could even tie this one on to the end of your fishing line and fish with it in a pinch! 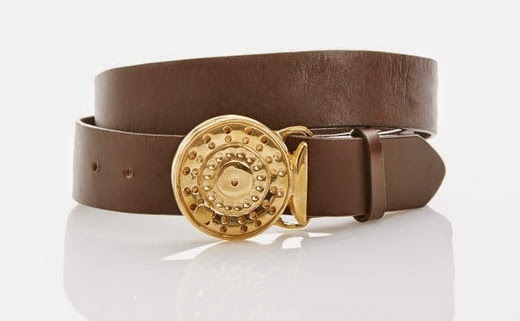 Priced at $32.95 if you just want the buckle or with a Italian leather snap belt (in a variety of finishes) for an extra $24.95 for a total of $54.95, about one half the price of what competitors are selling it for and not available except as a package! The brass fish hook buckle and leather snap belts are available online at Skipjack Nautical Wares. 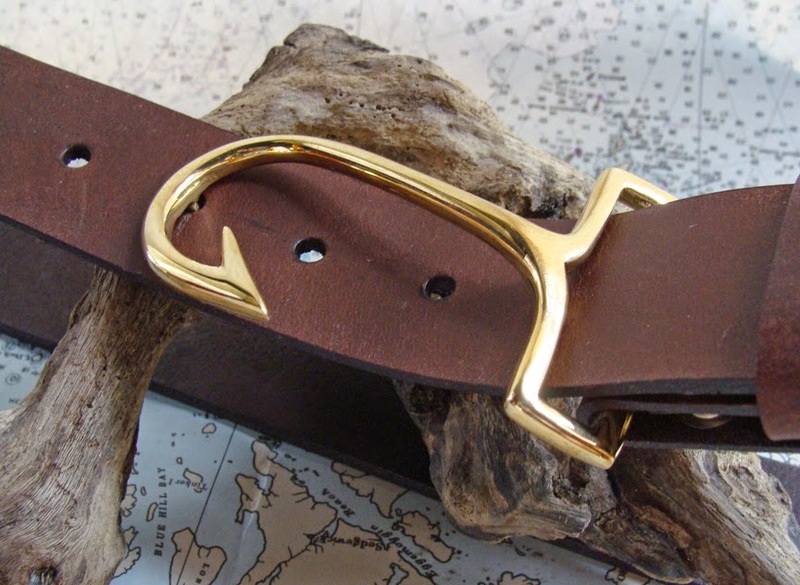 Skipjack's polished cast brass fish hook buckle with Italian leather snap belt. A recent trip to Nantucket, Mass. brought us to an exceptional clothier and leather shop (thank god they were open) that had exceptional selections of nautical/coastal men's belts and buckles. First was Craftmasters of Nantucket. This special leather goods store had a wonderful selection of leather belts and nautical-themed brass belt buckles to choose from. They also create and sell leather briefcases, and luggage to the finest gold and silver jewelry. Owner and resident David Masters is also a talented scrimshander and the only one on the island to use color inks in his work. Brass or sterling belt buckles, (14k) Gold or silver cuff-links, brass money clips, and USA made Buck Knives are available with your initials in international code flags. Located at 7 India Street in the Nantucket Historic District, it is a must stop to find some really exceptional items that will certainly add to your wardrobe. I actually purchased (go figure) a Stetson hat at Craftmasters. It was cold and rainy day, so the canvas safari hat with leather band was just the ticket. I could not locate a web site for their store , but here is a link to their facebook page and of course there are numerous articles to be found on the web about this jewel of a Nantucket store. The next stop was Murray's Toggery Shop at 62 Main Street, also located in the heart of the Nantucket Historic District. A wide cobblestone street which paves most of the historic district faces this famous haberdashery since 1945 for men, women and children. Known for their selection of Nantucket red apparel, Nantucket Reds are synonymous to Murray's Toggery Shop on the island of Nantucket, and he pants were featured in The Official Preppy Handbook. Nantucket Reds are originally inspired by cotton trousers worn in Brittany. A characteristic of Reds is that they fade to a "dusty rose" as they age. Since their inception, the cotton canvas pants had been marketed as shorts. The distinctive salmon pink color has since been used on hats, shirts, sweaters and socks. So we've selected a few items from Murray's to feature in this blog. 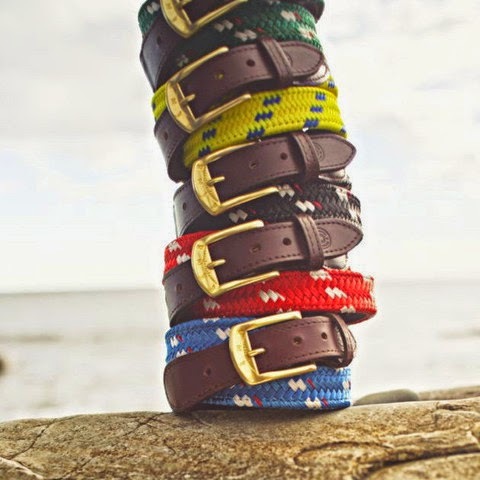 Murray's carries a wide variety of men's nautical, beach and "Nantucket"accessories including a super collection of belts. Prices on their website start at $35.00 but most are $40.00 and up. Shown below is one of my favorites, a needlepoint belt made by Smathers & Branson of bluefish and stripers. Measures 1 1/4" wide by standard lengths. This entirely hand-stitched belt will set you back a bit retailing at $175.00 to $200.00 depending on the length. Bluefish and stripers needlepoint belt for men by Smathers & Branson. I also really liked York River Traders Mariner rope belts available in a variety of colors. Crafted with real rigging line, backed by high quality leather and complemented with solid brass compass buckle. This collection of belts retails for $98.00. 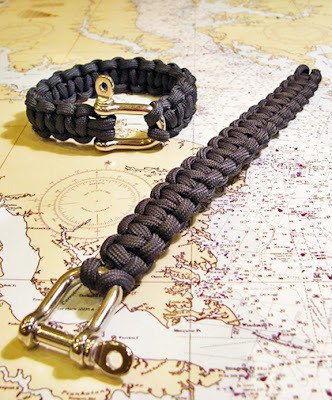 York River Traders Mariner Rope belt is available in a variety of nautical colors. Leaving Nantucket Island, we head over to Martha's Vineyard, Massachusetts to visit Vineyard Vines. Here we have selected their new brass fishing reel buckle belt with 100% leather belt. Available online at Vineyard Vines for $115.00. Next we are featuring the waxed-cotton sailing belt from Orvis. Sturdy waxed cotton makes this men's nautical belt both durable and weather resistant—a combination that serves well on or off the water. Stainless steel grommets, nickel-plated solid brass shackle-style buckle. Genuine leather keeper. In navy/brown. Southport, Connecticut. Even waist sizes: 32-40. 1¼" wide. Retails online for $129.00. Waxed-cotton sailing belt from Orvis. It would be blasphemy to not include a selection from one of America's great designers, Ralph Lauren. Pictured above is his "Lighthouses and flag" belt. This nautical-inspired braided-cotton belt is designed with a silk-trim overlay that features an allover pattern of vibrant lighthouses and flags. Available at many stores and online for $75.00. Lighthouses and flag belt from Ralph Lauren. This year I am including men's belts from Brooks Brothers who has an impressive selection of seriously seaworthy accessories for men. They now also represent one of my favorite belt designers Kiel James Patrick, so here we feature a braided belt, made from cotton, with silk backing. Solid brass anchor buckle. Leather tab stamped with KJP Croffix Anchor on the front and Golden Fleece® logo on the reverse. Made in the USA. Retails online for $118.00. by Kiel James Patrick for Brooks Brothers. Planning to give your love one a valentine's gift? Is she or he nautically inclined, a real boater? Well here's one that will certainly tie the knot...a real twist on the usual Valentine's Day box of candy. How about your best friend, mom or other family members. You may need a little help finding something special that's affordable too! 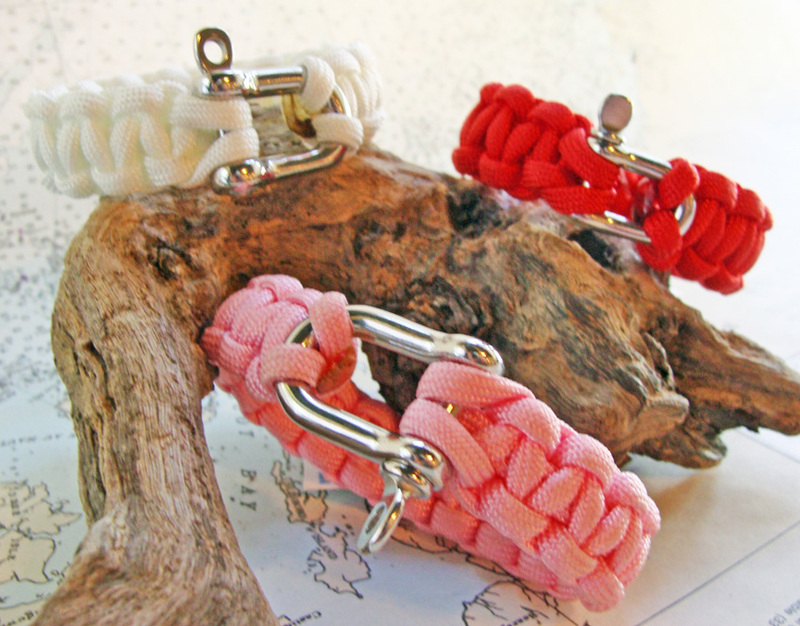 Here’s the perfect gift for your loved ones- the Mariner nautical rope bracelet in great Valentine's Day colors including soft pink and valentine’s red nylon line for her or a more traditional nautical color for him, and it's a great gift for only $24.95. 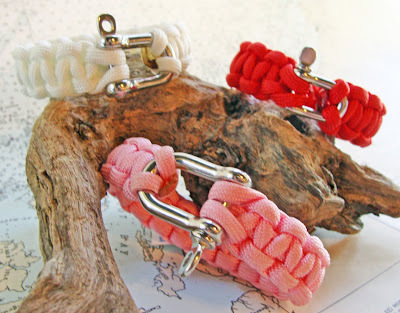 Skipjack's Mariner Reef Knot Nautical Bracelet in great Valentine's Day colors! 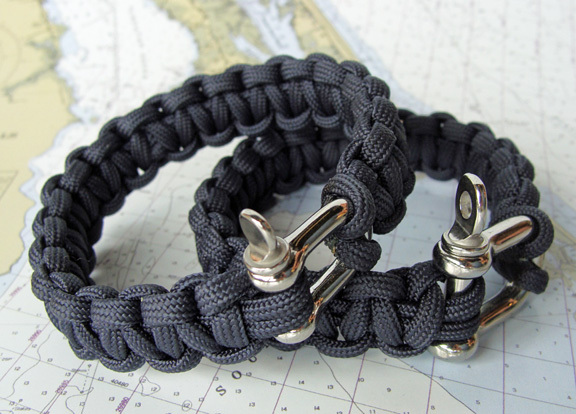 The Mariner bracelet is perfect for boaters, surfers, beach goers or anyone that enjoys being in or around the water- quick drying nylon and stainless steel shackle won't rust! Bracelets are available with small (7/8" long) or large (1-1/8" long) shackles. The width of the knotted bracelet is just under 3/4". The knotted width is the same regardless of shackle size. A great item for men, women and children alike. Here's the link to Skipjack's Mariner nautical rope bracelets with new jewelry items being added each day! Skipjack's Mariner Reef Knot Nautical Bracelet . Here's the link to Skipjack's Sailor's Locker where you will find a great selection of nautical themed and island inspired apparel, jewelry and great accessories too! New England Lobster bake piping hot from the grille. February is always a slow month at our nautical store, Skipjack Nautical Wares & Marine Gallery in Olde Towne Portsmouth, Virginia and the best time to get away for a much needed break. So Alison and I, together with my daughter Kaitie packed our bags and drove the 15 hour drive south to sunny Florida leaving the cold weather behind for a little R&R, seashell hunting at MacArthur Beach State Park, antique browsing in the numerous Palm Beach areas, inventory purchasing from a distributor and to visit family in Royal Palm Beach and Palm Beach Gardens. First stop was to the home of my sister Roxanne and her husband Gerry and my mother Mary Ann Elder in Royal Palm, Florida. The lobsters, mussels, clams and fresh produce came from the famous Carmines Gourmet Market located in Palm Beach Gardens, Florida. After an exhausting day of antiquing in the elegant shops located along Antique Row on Dixie Hwy. in West Palm Beach, we drove over to the delectable Carmine's Gourmet Market where my mother treated us by purchasing the ingredients for a surprise Valentine's Day dinner feast. 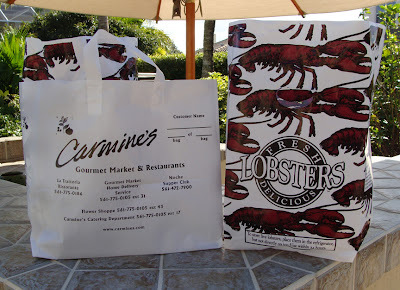 Fortunately, Carmine's was running a special on fresh lobsters making the drive from Royal Palm more rewarding. I highly recommend Carmine's for the best in gourmet foods, select wines and other desirable products, not to mention their La Trattoria Restaurant too! Here's a link to their website at Carmine's Gourmet Market & La Trattoria Restaurant. Roxanne had discovered the recipe for the lobster bake in the July 2010 issue of Coastal Living magazine titled "Summer Lobster Bake" bringing Hartzogs' classic lobster bake to your backyard and had had the opportunity to test this fabulous meal on previous occasions. So off we went with bags rustling with fresh lobsters, breads and wine in hand back to Royal Palm and preparation of the seafood feast. Roxanne used a large oval metal pan that could hold the six lobsters, mussels, clams, potatoes, corn on the cob and other ingredients and would also fit on the outdoor gas grille. Coastal Living suggests that you can use a large disposable aluminum roasting pan, but we recommend a heavier pan because of the extra strength for carrying the weight. Gerry first par-boiled the lobsters outside on their open-air patio in a large gas-heated pot (basically designed for frying turkeys) until cooked (approximately 6 minutes after the water is piping hot) then transferred the lobsters over to top the other ingredients already placed in the pan for baking and then covered with aluminum foil. 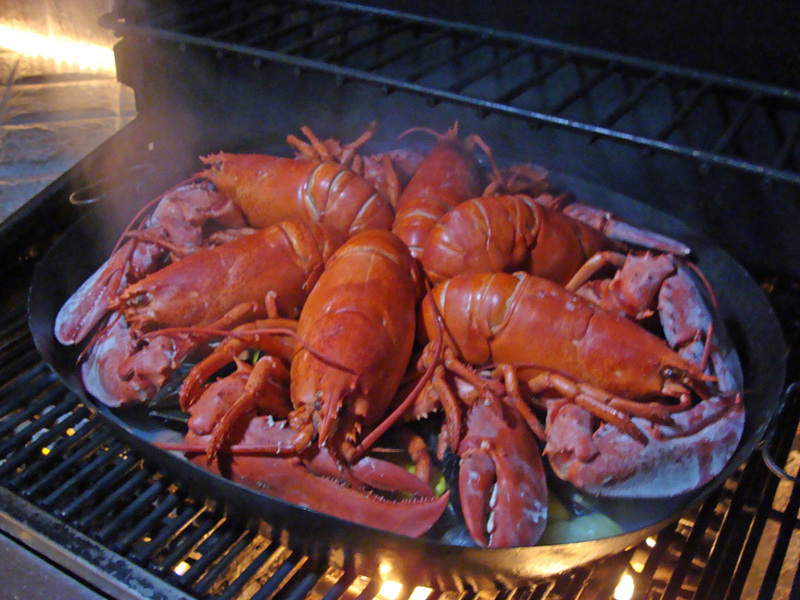 The par-boiled lobsters are transferred on to the top of the already prepped seafood and vegetable-filled pan. 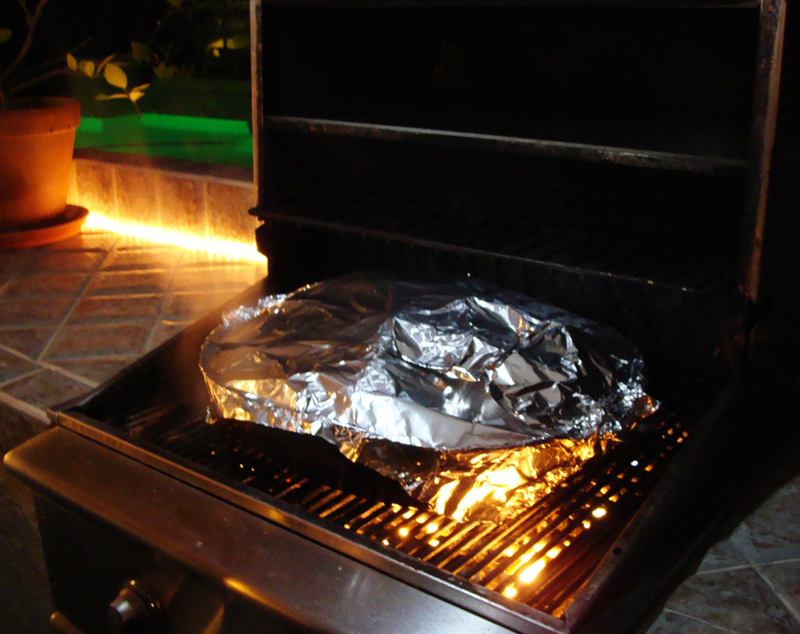 The pan is covered in aluminum foil and then cooked over open flames at medium-high heat on the gas grille. The pan is then covered in aluminum foil and placed over medium-high heat on an open grille to cook for approximately 30 minutes. 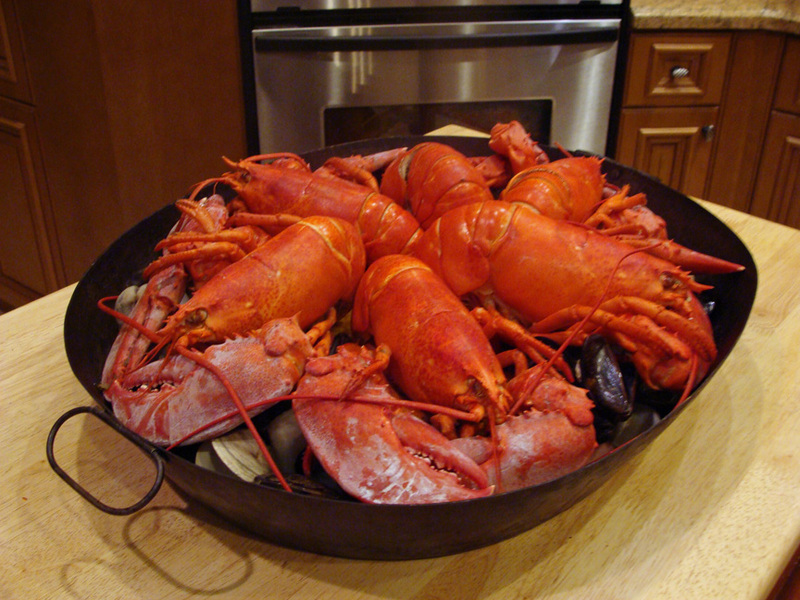 Once cooked, Gerry carried the hot pan into the kitchen to cut up the lobsters and prepared for serving. 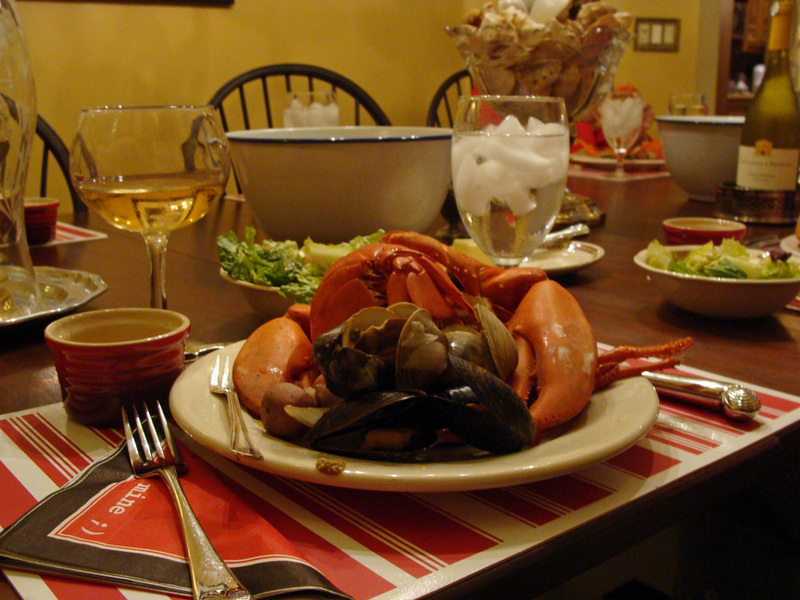 The fully cooked lobster bake was brought into the kitchen to be cut-up and served. Each lobster was trimmed of their tails and claws and put on a plate and the remaining carcass was disposed of. The plates were then garnished with mussels, clams, red potatoes and small ears of corn and served with a salad and freshly baked bread and melted dipping butter. The dinner was completed with a glass of chilled sparkling wine, pinot grigio, or chardonnay. The lobster bake served up on a plate ready for eating. Roxanne placed large stoneware bowls on the table to discard the lobster, mussel and clam shells and extra napkins for wiping your hands. What a great Valentine's Day feast! Magnifico! Here is the link to the ingredients and cooking instructions from Coastal Living Magazine on My Recipes. 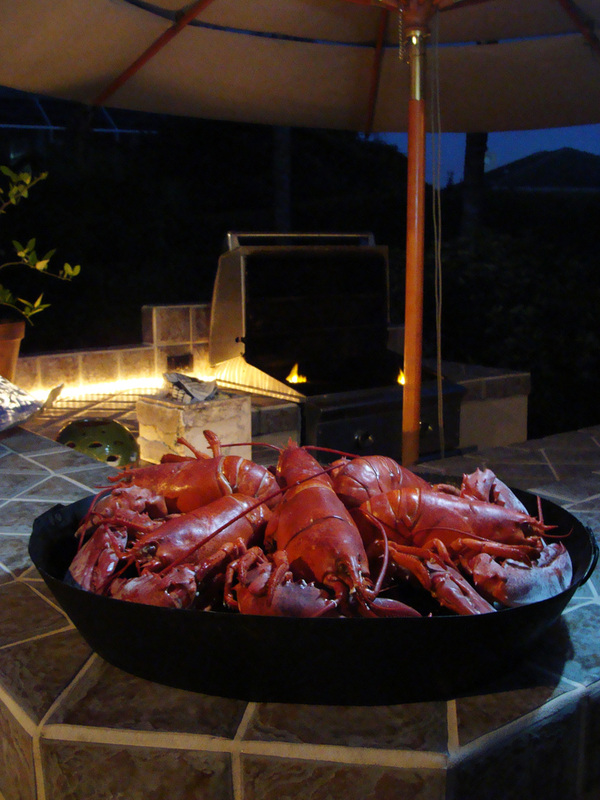 Summer Lobster bake. The recipe is sized for two people, so Roxanne tripled the ingredients to serve six. Photos by Joe Elder. 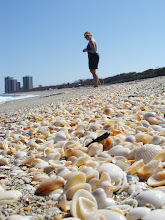 Upcoming blogs from our trip to Florida- Seashell hunting at MacArthur Beach State Park, Antiquing at West Palm Beach Antique Row, and Palm Beach's fabulous Worth Avenue. 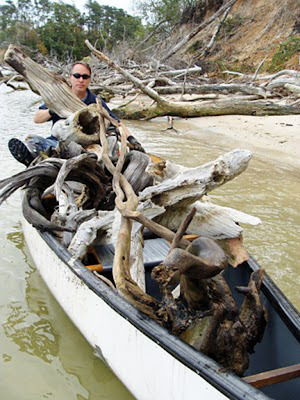 A day of successful driftwood hunting, Allen Graves paddles our findings home. As the 2011 holiday season is now coming to an end with the new years is just a few days away, my current mind set is now focused on the new year and great endeavors that lye around the bend. Fortunately, a driftwood hunt with my good friend Allen Graves is just that. So in a few weeks, we plan to return to our favorite hunting ground and brave the frigid winter weather and icy cold water via wading and paddling a canoe along the banks of the Rappahannock River. Allen's cousin owns at least a miles worth of private desolate riverfront property along the Rappahannock, an estuary from the southern section of the Chesapeake Bay. Here's a link to the first blog covering a previous driftwood outing. 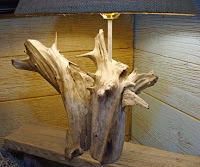 Just click on the link here to: Driftwood Art & Furnishings: Re-Purposed Beach Finds For the Coastal Home. Our last one-day hunting expedition last fall turned out to be quite fruitful and we gathered a number of wonderful water worn and sun-bleached cedar that is found in abundance washed up on the empty beaches or toppled off a cliff from a harsh nor'easter. Exceptional gnarled and twisted pieces of driftwood, sun-baked to a silvery patina with rich aromas of spicy cedar. Magnificent- the perfect sculptured wood created by nature and it's changing seasonal weather that produce these beautiful torsos and branches of wood for us to work with. So, before we get underway, I'd like to share with you a few of the driftwood lamp creations that we have recently produced here in our Skipjack design studio located in Olde Towne Portsmouth, Virginia. 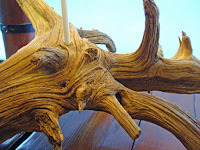 We hope to create other unique driftwood sculptures and coffee tables, perfect for the coastal home. 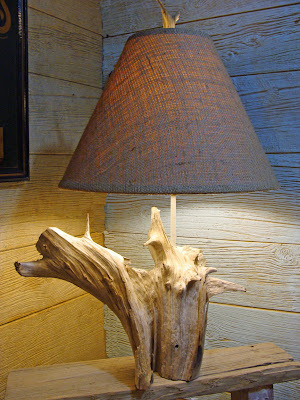 Custom made driftwood lamp with burlap covered shade. Close-up of cedar lamp base. 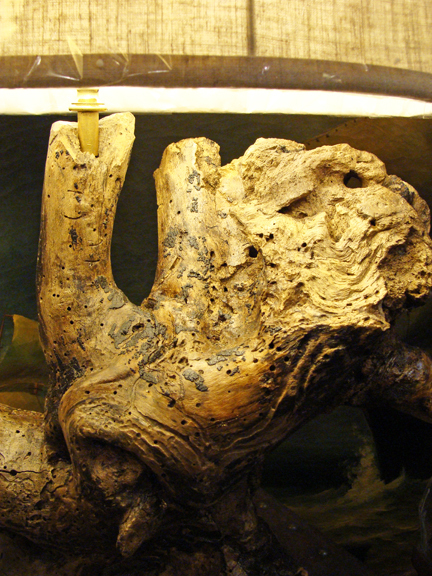 The first of the driftwood lamps (shown above) was produced from one piece of driftwood and has a broader, more horizontal appearance. 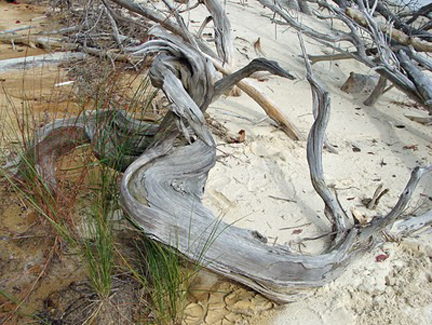 Great gnarled cedar with light-brown color and sun-bleached appearance. Pieces like these require a larger table to display and use, though I love these as a counter-top or bar light. Stands 25 1/2 inches tall. Here's a link to the beachcombed driftwood lamp CJE002. 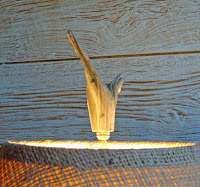 Cedar driftwood lamp with burlap shade. 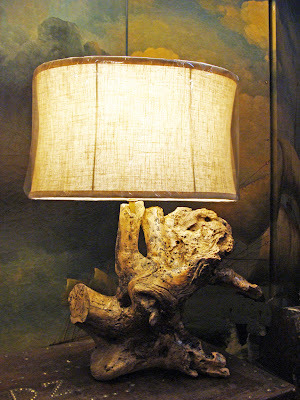 This driftwood lamp was also produced out of single section of a driftwood cedar with a silvery-gray sun-bleached patina. The center rod we've used is painted off-white with authentic milk paint making it less obtrusive than brass. 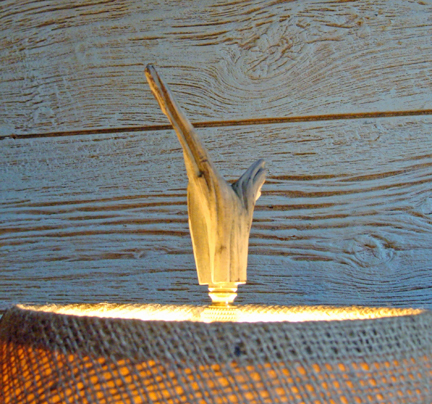 Comes with a custom-made driftwood lamp finial from the same cut of the cedar driftwood. Measures 29" tall. 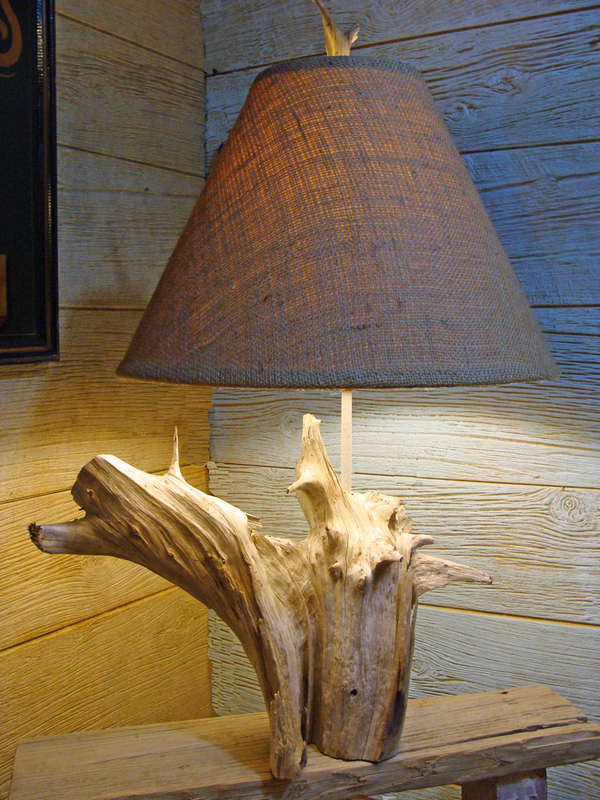 Here's a link to the lamp on our website: Beachcombed driftwood lamp CJE003. 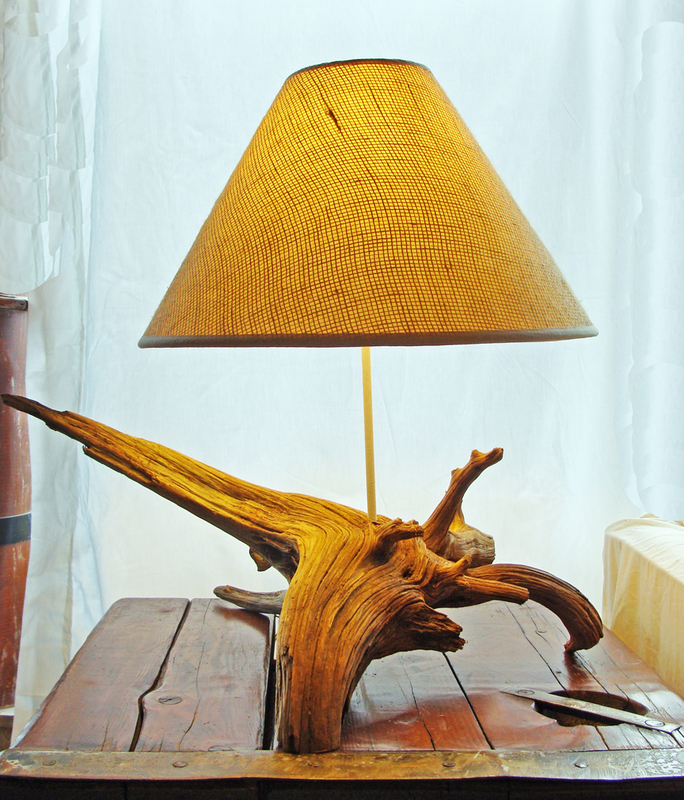 A cedar driftwood lamp produced in Skipjack's design studio. The next driftwood lamp, also produced out of cedar is larger in scale featuring beautiful gnarled root section with great color and patina. We've sealed this lamp using numerous thin clear coats to enhance the wood color with a glossy patina. This lamp features an oval shaped beige fabric lamp shade that matches the color of the wood and comes with one of our handcrafted monkey's fist lamp finials. 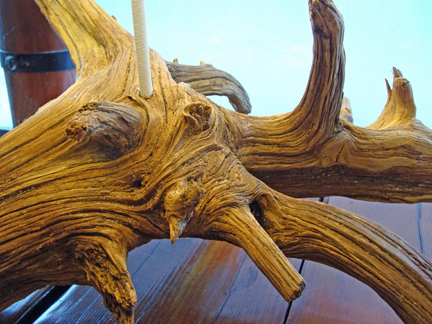 Follow the link here for more information on this beachcombed driftwood lamp CJE001. Beachcombed driftwood lamp. 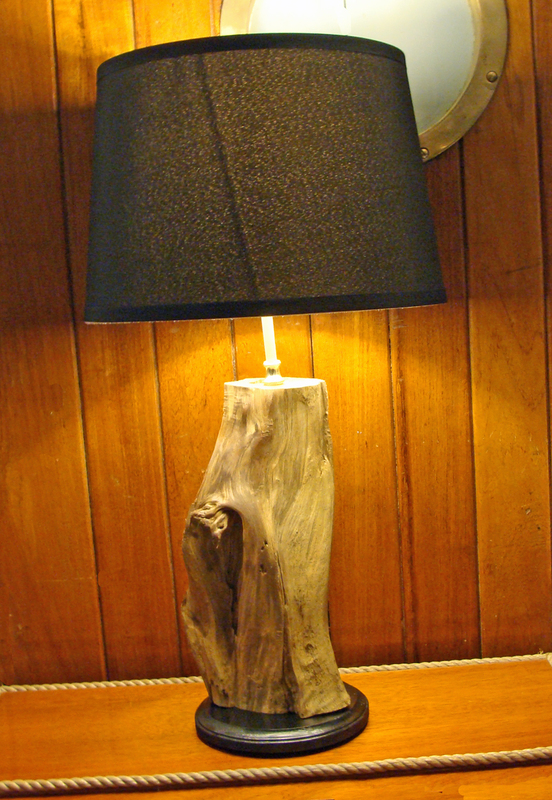 Cedar driftwood lamp with black base and shade. The last of our recent lamp productions features a section of cedar selected from a larger piece to create a smaller lamp where size is a consideration. We added a gloss-black painted round wood base with molded edge and a drum shaped black fabric shade to give it a more dramatic look. Wonderful small size for an occasional or bedside lamp. Stands 24 1/2 inches tall. Here's the link to this driftwood lamp CJE004. We will post pictures and information of our newest furnishings created in our design studio from our upcoming trip to the Rappahannock River. Hopefully you may find just the right lamp, sculpture or table to use as part of your coastal home decor! * Environmentally sustainable furniture is a fairly new concept in the marketplace, though here at Skipjack we have been utilizing this concept for many years. Simply defined, sustainable furniture and furnishings, also known as Eco Furniture is constructing furniture using materials which are recycled or re-purposed such as wood, metals and glass. The Skipjack design studio utilizes many shipboard items that are removed from retired ships in foreign and domestic shipyards as well as natural materials such as locally found driftwood, boards and vintage fisherman's materials to produce one of a kind nautical/coastal furniture and furnishings! Here's a link to see other examples from Natural driftwood sculptures, lamps and furnishings by C. Joseph Elder. 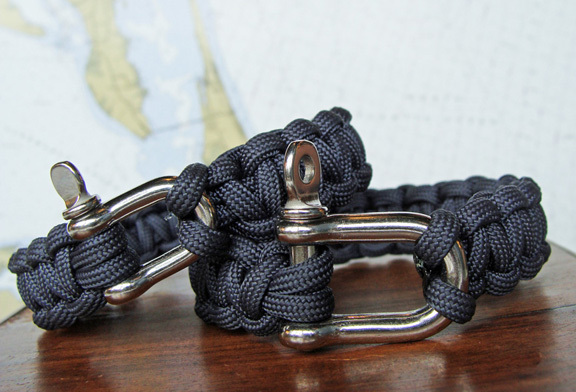 Mariner nautical rope bracelet in navy blue with stainless steel shackle clasp. Skipjack's Mariner bracelets are sold by their actual length to the half inch. For best fit measure the diameter of your wrist with a cloth measuring tape or wrap a piece of string around your wrist and then measure the length of the string against a ruler. We have found most people select a bracelet 1" - 1-1/2" larger than their wrist size. Please call or email for sizes smaller or larger than listed. The Skipjack Mariner nautical rope bracelet will easily ship in a Small Flat Rate box by USPS Priority Mail in the USA for approximately $5.00! Have you ever wanted to own your piece of island paradise? Ready to trade it all in and move to Bora Bora? Well, I don't know about you but I can certainly say that it has certainly crossed my mind here and there...giving up the rat race in exchange for the island lifestyle, sitting back in a lounge chair basking in the sun with a cool tropical breeze on my face and sipping on a freshly made pina colada and dipping your toes into crystal clear water! Sounds to good to be true...well if you're gutsy enough to give it a go and have fairly deep pockets, this could be your calling. Bora Bora Blue Heaven Island Paradise property LAX to Borra. Own your own Private island! 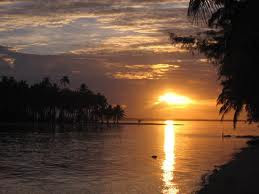 Blue Heaven Island sits approximately one mile north east of Tevairoa. A 5 acre section on the island Motu Paahi. Auction is for lots 5, 6 & 7 comprising of 5 acres. Bidding: Interested parties are required to contact the auction house prior to bidding. Known as the pearl of French Polynesia, Bora Bora is the single most famous island in the world. Yet, when you visit this quiet, uncrowded, unspoiled haven, you will become part of a truly unique experience known only to a very few. Between the deep blue Pacific and the crystal clear Bora Bora Lagoon, sits Blue Heaven Island. 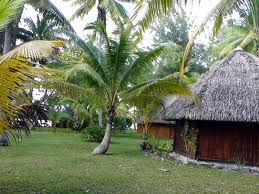 This beautiful 5 acre property on a small island motu can accommodates a total of 10-15 people, providing a private haven of relaxation and exclusivity. Surrounded by magnificent waters of infinite depths and color ... you are now steps to heaven. This secret gem has been a 4.5 Star rated destination getaway with quality island bungalows: "our Quaint bungalows are tucked away between Palm trees, lush plant life, and vibrant flora. 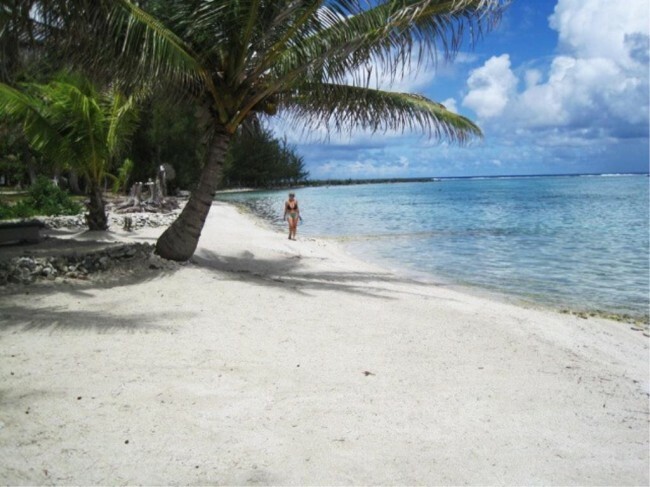 Every bungalow on the island is just steps away from our private beach. Each quarter is the essence of simple island living. The cozy bungalows are made of indigenous bamboo and equipped with all the amenities, including private bathrooms, large closets, and ceiling fans. Installation run on solar energy (photovoltaï roofs and solar water-heater) and the water system is feed with a well and rain. Wake up to gentle breezes, the sounds of the seashore, and early risers can walk a few steps and catch the luminous sunrise as it lights up the crystal clear lagoon. Owner Monique La Voie had always dreamed of island living. After traveling to Mexico, Central America, the Caribbean, and other islands around the world, she found her little piece of heaven on beautiful Bora Bora in French Polynesia, and named it Blue Heaven Island. Now you can own this exclusive private island. Are you ready? Well here's the information that could make this into a reality for you! Blue Heaven Island is up for auction, Friday, June 24th with an estimated auction price of $5,000,000 to $7,000,000 with a starting bid of $2,500,000 and no buyers premium. What are you waiting for! Just follow the link and make your dream a reality! Live Auctioneers Blue Heaven Island. THE BEST IN COASTAL LIVING! Coastal Creations & Design Favorites. . . for those of us that love the beach! Barbara Jacksier's The Book Blog- "Waterside Cottages"
© 2012 Copyright Skipjack Nautical Wares, Inc. & C.Joseph Elder. All rights reserved.. Watermark theme. Powered by Blogger.